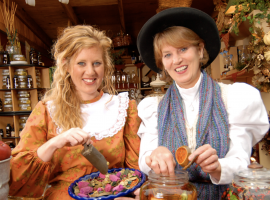 Silver Dollar City’s Crafts and Cowboy Festival begins September 12 and goes through October 27. This festival will host over 125 visiting demonstrating craftsmen. This is in addition to Silver Dollar City’s resident craftsmen. A few of the festivities and things to check out include: the Wild West Show, Buck Taylor’s Cowboy Emporium, barn dances, visiting musicians, and the famous Silver Dollar City Stagecoach. According to Silver Dollar City, The National Crafts & Cowboy Festival was named “One Of The Nation's Top 8 Fall Harvest Festivals” by U.S. News & World Report Travel, as well as “The Best Fall Festival in Missouri by Travel & Leisure! "This is the last festival until Silver Dollar City transforms into a Christmas Wonderland. Make plans now to attend the Crafts and Cowboy Festival and then come back again in November to experience Christmas in Midtown! Call us at 877-368-3782 to purchase a 2-day ticket for just a few more dollars than the price of a 1-day ticket!